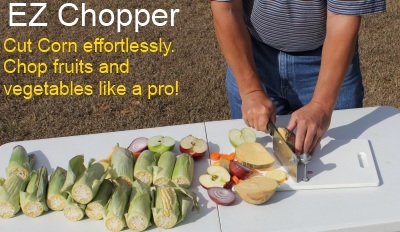 If corn cutting is a chore for you, the EZ Chopper with Cutting Board is ideal to make light work of cutting off corn cob ends and can also be used to cut fruits, vegetable and boned meats. 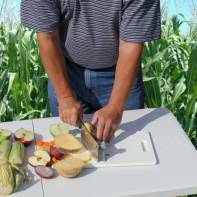 The corn cutter cleaver rotates on the food-safe board. Forged metal runs through the handle making the EZ Chopper practically indestructible. The perfect complement for the EZ Creamer.